A month ago an air strike on a school bus by a Saudi-led coalition fighting in Yemen killed at least 29 children, drawing widespread international condemnation. The coalition, which is backing Yemen's government in its war with the rebel Houthi movement, has acknowledged "mistakes" and promised to "punish" those responsible. Western powers have demanded the coalition takes concerted steps to protect civilians. But for the families still in mourning there is little to ease their sense of loss. It was just before sunrise on 9 August when Dr Ali al-Taifi emerged from the operating theatre. As head maxillofacial surgeon at the al-Talh hospital in the rebel-held city of Saada, he had worked a night shift and was preparing to go home. The market in the town of Dahyan, 20km (12 miles) to the north, was already stirring, with traders and business owners arriving for the day. At his home nearby, Zaid Hussein Tayyib was having breakfast with his family. Three of his five sons were due to go on a trip marking the end of their Koran summer school, but Mr Tayyib was reluctant to let them go on a large group outing. "We're waiting and expecting a strike at any time - in the market, in the mosque, at school, a gathering, a wedding, a funeral," he says. Saada province, the Houthis' stronghold, has come under particularly fierce bombardment by the coalition since it intervened in the conflict in March 2015. Coalition air strikes have been the cause of the majority of the 17,223 civilian casualties - 6,660 dead and 10,563 injured - documented by the UN. Despite the risk, Mr Tayyib allowed his sons - Youssef, 14, Ahmed, 11, and Ali, nine - to go on the trip. A mobile phone video released by the Houthis shows a bus packed with students in high spirits. They are also seen reciting verses from the Koran with a teacher in a tent at a "garden of martyrs" where many of the war dead are buried, before running out into the cemetery and calling out to each other. At about 08:20, Mr Tayyib was waiting for a colleague near the market when the bus transporting the children stopped nearby. Witnesses said the driver had stopped to buy drinks and snacks for the boys. There was barely time to register the screeching of jets overhead before the bomb hit. Mr Tayyib was in a state of shock and panic as he approached the scene. "I felt pain - pain, pain, indescribable pain," he says. He began searching for his sons. He lifted up the lifeless body of one child, a blue Unicef rucksack still on his back. It was only when he turned the boy's face towards him that he realised it was Ahmed. He had found Youssef and laid his body on the pavement next to his brother when his wife called, desperate to know where their children were. When he broke the news to her and said that Ali was still missing, she made him promise that he would not return home until he found their son. The rush of casualties from the strike arrived at the hospital so suddenly that there was no time for Dr Taifi to ask what had happened. As he tended to the casualties, he was struck by their age. Until this January, Dr Taifi had worked at one of the main hospitals in the rebel-controlled capital Sanaa and had attended to the victims of many mass-casualty attacks. But he says the scenes following the strike in Dahyan were the most horrific he has yet witnessed. The Houthi-run health ministry said 40 children and 11 adults were killed, and 79 other people wounded, of whom 56 were children. The International Committee of the Red Cross (ICRC) confirmed that the al-Talh hospital received the bodies of 29 children. Human Rights Watch has meanwhile documented the names, ages and status of 34 people who died - including 25 children and three teachers who were on the bus; and a child, a teacher and two other men who were standing in the market. Despite the age of the casualties, the coalition initially insisted the strike was a "legitimate military action, conducted in conformity with international humanitarian law and its customary rules". Spokesman Col Turki al-Malki said it had targeted Houthis responsible for launching a ballistic missile from neighbouring Amran province that was intercepted over southern Saudi Arabia the previous night. The debris from the missile killed one person in the city of Jazan. Image caption Col Turki al-Malki said the coalition strike was a "legitimate military action"
Two day later, the Saudi mission to the United Nations said the coalition had referred the operation to its Joint Incidents Assessment Team (JIAT) for investigation in response to reports "claiming that a bus was subject to collateral damage". On 1 September, the coalition said the JIAT had identified "mistakes in compliance with the rules of engagement". The coalition expressed "regret" and said it would "undertake legal proceedings to hold the ones who committed mistakes accountable". 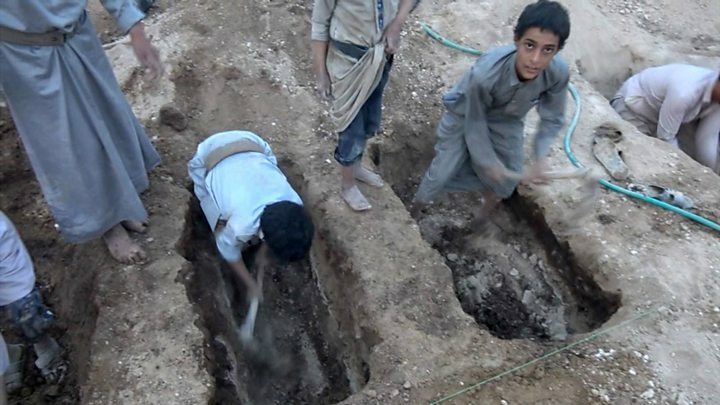 It also promised to work with Yemen's government to compensate the victims' families. JIAT legal adviser Lt Gen Mansour Ahmed al-Mansour said commanders acted on intelligence that a Houthi leader responsible for military training, whom he identified as Mohammed Abdul Hafiz Sitteen, was on the bus along with three other men responsible for recruiting and training fighters. But the general said the strike was not needed to prevent an imminent attack and that it should have taken place when the bus was "in an open area to avoid such collateral damage". He said there was a delay in issuing a no-strike order. Mohammed Hajar, an official at the Houthi-run health ministry, rejected the coalition's allegations that the children were being used as human shields, saying it was "impossible" that there were fighters on the bus. The Houthi-run education ministry said Mohammed Sitteen was a 28-year-old teacher at the Koran school - an assertion supported by parents who spoke to the BBC and children interviewed by Human Rights Watch. 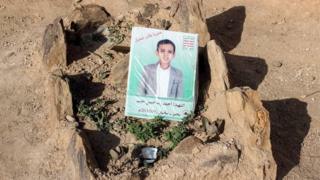 Another of the teachers identified by the ministry was Ali Hussein al-Ajri. His brother Yahya says the 27-year-old father of three volunteered at the Koran school every day after finishing work at the shop he owned. Yahya was shocked to hear the coalition's allegations. "He's my brother and I know him," he says. "He has never picked up a weapon. He didn't even carry a jambia dagger." Both Dr Taifi and Dr Abbas al-Muttawakil, the head of the emergency room at Saada's al-Jomhouri hospital, also say there were no combatants among the casualties they treated. After the JIAT investigation, the coalition stressed it remained committed to abiding by international law, and that its rules of engagement were applied "in accordance with the highest international standards and practices" in order to preserve civilian lives and objects. However, UN human rights experts had said only days earlier that there were reasonable grounds to believe that individuals in the coalition "may have conducted attacks in violation of the principles of distinction, proportionality and precaution that may amount to war crimes". They cited air strikes on residential areas, markets, funerals, weddings, detention facilities, civilian boats and medical facilities. The coalition rejected the experts' report, which also accused the Houthis of possible war crimes, saying it contained "false allegations". In its report on the Dahyan strike, Human Rights Watch noted that under the laws of war all parties must "do everything feasible to verify that targets are valid military objectives". "Witnesses said there were no armed men in the market or on the bus, and videos taken on the bus before the attack do not show any fighters or weapons," it said. The group could not confirm the absence of a Houthi military target in the vicinity, but stressed that even if it were present, "the use of a weapon with wide area effects in a crowded market would have been unlawfully indiscriminate or expected to cause disproportionate civilian loss". Based on photographs and videos of purported remnants of the bomb used, Human Rights Watch and investigative journalism website Bellingcat both identified it as a GBU-12 Paveway II, a 500lb laser-guided munition produced by US defence contractor Lockheed Martin. Neither the US nor Lockheed Martin has confirmed that the bomb was used, but the evidence has raised fresh questions about the role of Western powers in the war. The US, UK and France are providing logistical and intelligence support to the coalition and selling it weapons despite the alleged human rights violations. US Defence Secretary Jim Mattis said on 28 August that US assistance was "not unconditional" and would require the coalition to "do everything humanly possible to avoid any innocent loss of life". But he added: "We haven't seen any callous disregard by the people we're working with. So, we will continue to work with them." Although the UN Security Council expressed "grave concern" after the air strike, Mr Tayyib despairs at what he says is the "silence" of the international community over Yemen. "It's as if it was livestock that was targeted, as if it wasn't childhood that was targeted, as if it wasn't people who were killed," he says. It was not until five hours after the attack that Mr Tayyib got a call from the hospital telling him they had found the body of his third son, Ali. He borrowed a neighbour's car and brought him home. Mr Tayyib says that of all their children, his wife had a special bond with Ali. "You know the affection of a mother after their child has been away? She hugged him as if he'd returned after being away for 100 years, she wouldn't let go."